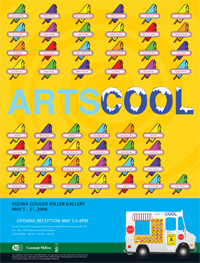 ARTSCOOL is the moniker chosen for this exhibit by our seniors, perhaps relishing the triple dimension of the word play. Most functionally, it is the name of the School of Art’s server. Most literally, it names the environment in which their investigations have germinated, sprouted and flowered over the seasons of the last four years. More imaginatively, it stakes a claim in the appeal of art, for as many reasons as the works on view. COOL can be as trendy and whimsical as fashion or as sophisticated and complex as a shifting paradigm. These works are COOL in their surprising variety, their experimental urges, awesome epiphanies, perfected gestures, sensitive interventions, ambitious attempts and stimulating resolutions — COOL in how they wildly or subtly mesmerize, and COOL in how they transport us to another realm, a new way of thinking or seeing. These artists are most COOL (and paradoxically HOT) in the questions they have asked of themselves and each other and the creative responses they offer to us now and into the future. ART IS COOL. SO IS SCHOOL. SO WAS SCHOOL. ARTSCOOL.